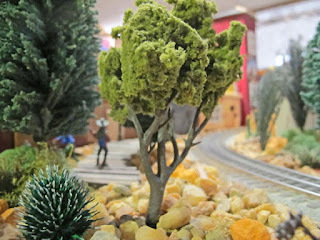 My Tombstone & Southwest Railroad layout needs lots of plant scenery native to the desert. So I'm always on the lookout for ways I can add to it. In my flower garden I noticed that the seed pods from my cornflowers looked a bit like those luxuriant yucca plants you see in desert surroundings, so I set about trying to make some mini yuccas for my layout. As you can see from the image they didn't come out too bad. This is a picture I used as my model. 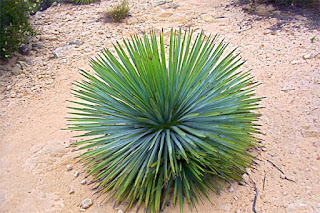 A real yucca in the desert. Here's a picture of my yucca made from the seed pod of the cornflower. I painted several in different colors. I thought maybe others might like to make some of these yuccas for their scenery, so I put together a little 9-step tutorial on how to make these. 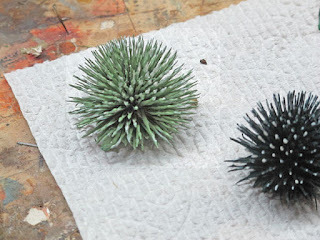 They are really easy to make and this is the time of year to collect some of these seed pods for this project. You can check out the tutorial on my blog. Just click the link below. Don't you love it when you can find naturally-occurring things like this to add realism to your layout? Great find baggetta!